A New You in the New Year-Making and Keeping Resolutions - Herb It Up This blog uses affiliate links, please see the Legal page (under About) for information on how we use them. Here we are, starting a new year. The holidays have come and gone and now most people are talking about eating better, exercising, or getting healthy this year. Is it really possible to attain a new you in the new year? Yes, it is-with the proper goals, a good plan and accountability to stick to that plan. And guess what- I’m jumping on that boat to have a new you in the new year too! Excerpt from Cultivating the Lovely Podcast. So what kind of goals or resolutions does an already herb girl set for the new year? Well, you know I’m just like you. Christmas parties with loads of dessert, candies, and cookies, family get-togethers with way too much food, routines went out the door so not a lot of exercise, and chocolate cravings-the struggle is real people! I don’t know if my digestive system can handle any more holidays and parties. Not to mention the fact that my kiddos have mentioned most days of the week that their tummies hurt. So yes, we are tightening up the restraints and all the junk food is out the door. We are going to detox, eat better and heal our guts! So how exactly am I going to get a new me in the new year? My main food or health goal will focus mainly on January. Now I definitely want to eat healthy the whole year, but that’s a vague goal. I’ve found that if I set shorter goals there’s a greater chance we’ll stick to it for that time. And others will be more supportive too. After that short time, we can re-evaluate and go from there. And it is much easier to actually plan out the steps to attain a goal if it’s broken down into a shorter time frame. For the 4 full weeks of January, we will not be eating any processed foods, refined sugars, or any grains. We will basically be doing the GAPS Diet . W e did the full GAPS Diet a few years ago, and although we only did it a short time, it made a tremendous difference in our digestive health. It is not just a diet, but is designed to heal your gut. Although the full GAPS Diet has other restrictions and additions, processed foods, sugars and grains are the main things we will focus on avoiding this month. After these 4 weeks, we will implement a traditional diet. We will be adding more probiotic foods to our diets each day. Our whole family will be detoxing and cleansing the month of January. We will start with a simple colon cleanse and then do a liver cleanse and kidney cleanse. (I’ll be posting more details about what specifically we are doing and taking to cleanse and detox.) I’m also planning on weekly foot detoxes in January and then continuing them regularly throughout the year. Since we are cleansing all the toxins out of our system, we need to add nutrients in-especially since most of our food (even fruits and veggies) are devoid of nutrients or at least have significantly less than we need. That’s why I’ll also be making this Resolution Tincture for us to take. And let me just say, if you are trying to lose some weight, then I’d suggest trying the tincture and tea. I’m planning on giving myself some TLC every other week. Now that might seem like a shallow resolution, but we all need some TLC every now and then. And for most mamas of littles everyone else gets taken care of before ourselves. I have some great skin care recipes that I’ve wanted to try for quite some time now and during Christmas I actually tried out a few of them. And you know what- it was so nice! Sometimes even finding a few minutes to repaint my nails (or maybe just take off that month old paint) would be a treat. Needless to say, this resolution doesn’t have to cost any money or be anything elaborate-although if someone wants to give me a gift certificate for a massage, I’ll be happy to take it:). Mostly, I just want to take a few minutes every week or so to treat myself to an all natural face mask, hair mask or some other beauty treat. And I’ll be sharing all my recipes with you so you can treat yourself too! How do you actually attain a new you in the new year? Now that we’ve got all our resolutions and goals written out, attaining them is another story. Here are a few resources that I’m using to help me stick to my resolutions that you might find helpful too. Although I went through this course this summer, I’m going to do a refresher of it now. 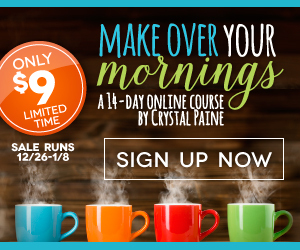 It really helped me make my mornings more productive and after all the craziness of the holidays, I could use some help getting back on track. Best of all it is on sale now-and it’s a great deal! Thrive Market is an online marketplace that has tons of organic, natural and healthy products reasonably priced and all in one place. Although it requires a yearly membership, you can try it free for 30 days. Their customer service is excellent, and they even donate a membership to a low-income family for each paying member that signs up. You’ve heard me say this is where I get almost all of my herbs and it’s where I bought the herbs for our detoxes and cleanses. We’ll be mixing up the Liver Cleanse Tincture, Immune Refresh Fiber, and Resolution Tincture to take this month. I’d love for you to join us as we cleanse and detox our way to health. If you’ve been thinking about a cleanse or about detoxing your body, these are a great start. What are my non-herbal resolutions for the new year? Of course, I have other resolutions that have nothing to do with herbs. And just to hold myself more accountable I thought I’d briefly share them with you too. Start making my own lesson plans for our homeschool. Something I’ve probably needed to do for awhile, but didn’t want to take the effort to do. I think I’ve finally faced the reality that the effort it will take planning them out will be well worth eliminating the daily stress of trying to “finish the lessons and books”. Decorate and organize our house. Update all my Periscope notes on here. Umm…yes, this was supposed to get done LAST year. But it didn’t. Plain and simple. So that will be done in this next week or so-hopefully this week! Back up my pictures and clean off our computer. Y’all I’m terrible with pictures. Oh, I take them. And many times I take pretty good ones. Oh, and editing-I LOVE editing them. But I take so many that by the time I get done playing with them, I never do anything else with them. In other words, I have tons of pictures taking up space on this computer and I’ve got to do something with them before my computer crashes! Wow, what a list. I think 2016 may be a busy year. But how good it will be to see all this accomplished. What are your goals and resolutions for this year? How do you plan on sticking to your goals? If you have any tips or tricks to stay focused on creating a new you in this new year, I’d love to hear them. Please share them below in the comments and join the community on Periscope! Happy Herbing It Up in the New Year! You go girl! 🙂 Best wishes for the new year! Thanks! Best wishes for you too! I’m so glad we ran into each other last week! I would love to get together sometime and get to know each other better. I think this year is going to be really busy for me too. One of my goals this year is to lose some weight, so I am looking forward to what you will share on your blog. Thanks for sharing your goals with us, it is encouraging to see others working toward their goals. I’m so glad I can be an encouragement for you as you work toward your goals this year. Yes, it is going to be a busy year, but I’m hoping to make it a productive busy year!